Use this handy form to keep track of Technifold crease settings. No need to start from scratch every time you set up a job! Keep track of info for single or multiple shift operations. Great for recurring jobs or repeat stocks. Use with any Technifold creasing products. 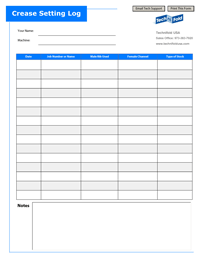 Print the form out to use good old fashioned pen and paper, or save and enter info in digital format. Are you getting our award winning Bindery eNewsletter? Our eNewsletter has been hailed as "the Industry's BEST Newsletter for Effective Bindery Tips"...Are you getting one? Sign-up TODAY...while it's still FREE! Have you checked out our award winning blog posts recently?